I found these this morning in the kitchen. 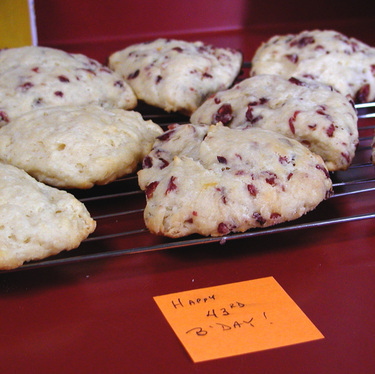 Cranberry-lemon scones, made by the sweetest husband last night when I was asleep. They were delicious! Edit: this afternoon Max and I were at the Barnes & Noble cafe for a little snack. He asked, "how old are you now?" "43", I answered. "43? You were 42 yesterday and today you're 43. 43. 43. 43." The lady at the next table was amused at how much entertainment Max was getting out of saying 43 over and over and over. I remarked that I wished he would just stop saying it. I've never been sensitive about my age, but when faced with it on continuous loop, to my surprise I got a little antsy. 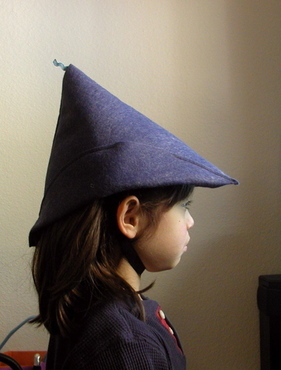 Update: Anamaria is offering to post a tutorial for her fabulous elf/Peter Pan hats! "Last night, someone saw a bunch of elves in the woods around here. They heard them say that they knew there was a birthday party here today, and they were going to hide some presents in the woods for everyone to find. And they left us some clues, here's the first one..."
The birthday party yesterday was a lot of fun! (I can say that now after a good night's sleep.) We went on a treasure hunt as a group. Thanks to your suggestions, I had thought about various ways to keep the group together, such as cutting the picture clues up into pieces and having the kids put them together to figure out the clues, but after a last-minute surge in planned attendance, it seemed like there were just too many kids to do that with. Cutting an 8x10 picture into 26 pieces? Well, it could be done, but the image of 26 kids trying to put together a puzzle at the same time, that seemed like a bad idea. So instead, I just instructed the group that we were going to stay together, and that I was going to read out all the clues. This mostly worked, toward the end it got a little chaotic, but at least no one jumped ahead to the next clues. It was a bit frustrating for some of the kids because the two older kids kept on finding the treasures, so finally I had to ask them to hang back and let the other kids find the treasures. Unfortunately I didn't manage to get a group photo of all the little elves. But here are a few photos of my little elf. First, the elf hat, idea and directions courtesy of the wonderful Anamaria. To the hats we added long flowing ribbons, little bells on ribbon loops, bird pins, a feather, safety pins with beaded names, skeleton keys, and a necklace with a little dragonfly charm and a small bell. This was followed by carrot cake cupcakes with cream cheese frosting, made by Dad and frosted by Max and Grandma. First the question. 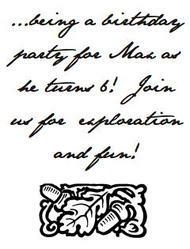 I'm planning a treasure hunt for Max's party. Has anyone ever done one with a sequential, partial participation clue search? I'm not sure how to explain this... I've been to parties where kids are given the set of clues, and then they run all over looking for the various treasures. Very fun, but I'm planning ours over a fairly large space and I don't want kids getting lost so I can't give them a randomized list of clues. I could do a treasure hunt where everyone gets the same clues in the same order, but then the older/faster kids always find the treasures first. Instead, I was thinking of picking 2-4 names out of a hat for each clue. Those 2-4 kids would get the clue and try to find the treasure together. 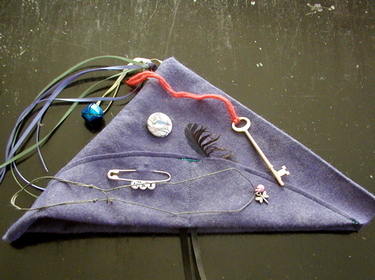 (Each treasure is something used to adorn their elf hats.) Then they would pass out the treasures to the other kids and everyone would put them on before picking the next set of names and moving to the next clue/treasure. It seems to me like it could work. But I know that many times, things that seem reasonable to me turn out to be very unreasonable when real children are involved. I could imagine kids getting impatient. Or perhaps not realizing that the 2-4 whose names were picked are the ones to search for the treasure while everyone else waits. I guess that's the problem, making everyone else wait. If you've ever done anything like this, or been to a party where such a treasure hunt scheme was employed, please let me know. Especially if it was disastrous. Even if you haven't been to such a party, please let me know what you think of the idea! TIA! We're having a big, outdoor party at a local non-profit that has a very nice campus with party space. And in keeping with our new status as a Waldorf family, it will be a kind, gentle party based on mythical forest creatures. (It's not that we've had wrestling and gambling parties for him in the past, it's just that I'm more aware of some things now.) I've spent the last year feeling very guilty for not allowing him to invite his preschool class to his 5th birthday party because we were having a very small party at our house, so this year it's wide open. He invited his whole kindergarten class, plus other friends. It will be in the afternoon, not coinciding with any meals so we'll provide only drinks and cake. Hopefully it will be a fun afternoon of playing outside with friends, with a little treasure hunt thrown in for a bit of extra excitement. 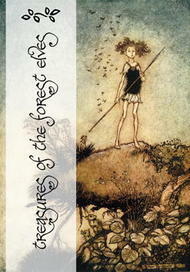 Front: picture is "One Aloof Stand Sentinel" by Arthur Rackham, #084 in this book. Overlay added in Adobe Photoshop Elements. "Treasures..." in Bilbo hand bold. Leaf motif (#1243) from here. Inside: "...being..." in Jane Austen. Acorn and leaf motif (#1061) from this book. Composed in Apple iWork Pages.